Months of Inventory (MOI) rose again in September to just shy of 11 months for detached homes. While MOI for both attached homes and apartments remained at historically low figures of 3.41 and 2.65 respectively, they both have upward trending trajectories. 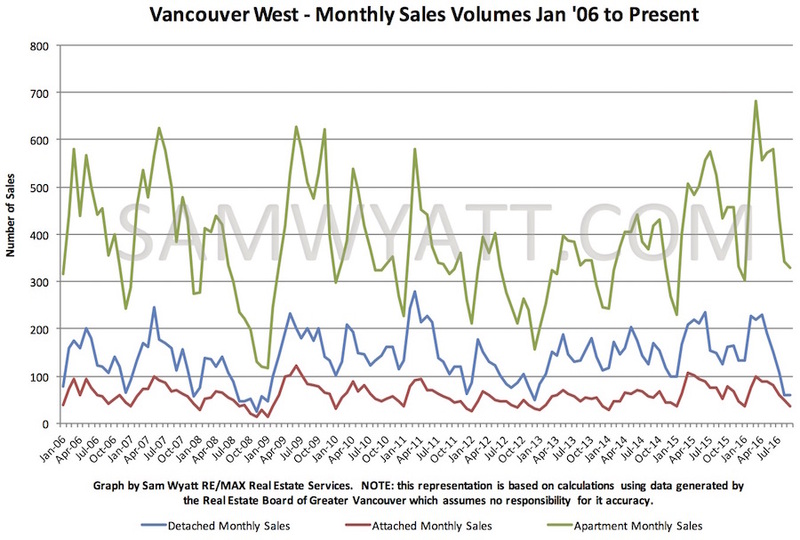 Sales volumes have been declining since things peaked in about March or April depending on home type. This is a pretty typical annual sales cycle but the pace of decline really increased in August. The resulting rise in MOI, particularly for detached homes has put downward pressure on house prices. 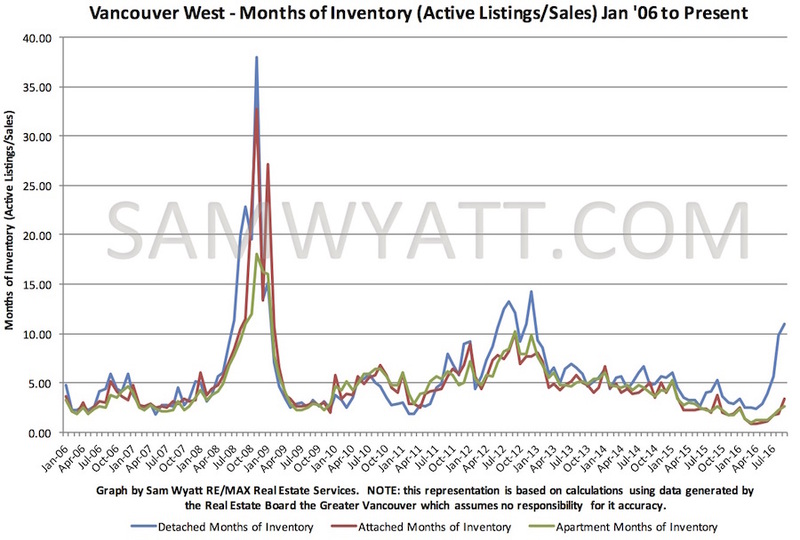 The annual low point for sales volumes is typically December or January so expect to see volumes to continue to fall. With only 60 detached sales of Westside houses in September we are on track to better December 2012's low point of 49 sales. I don't expect us to beat the November 2008 low of 21 sales. 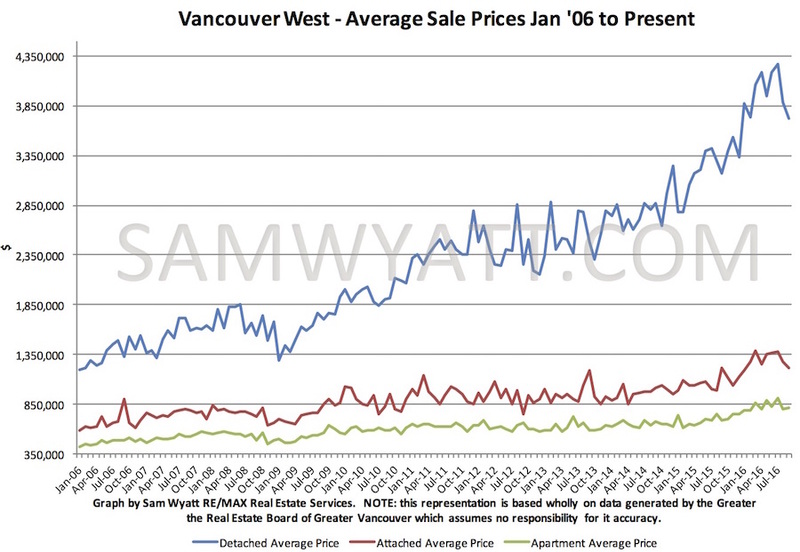 I am generally a fan of the Real Estate Board of Greater Vancouver's HPI price which tracks the price of a theoretical "typical" home. This month it fails to capture what is happening. It shows detached and attached home prices leveling off and apartment prices falling. 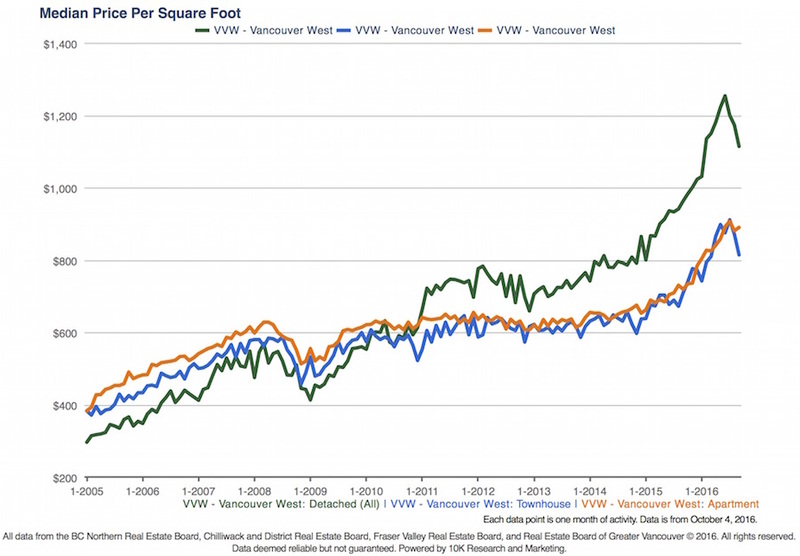 A quick look at the price per square foot sales values show exactly the opposite. 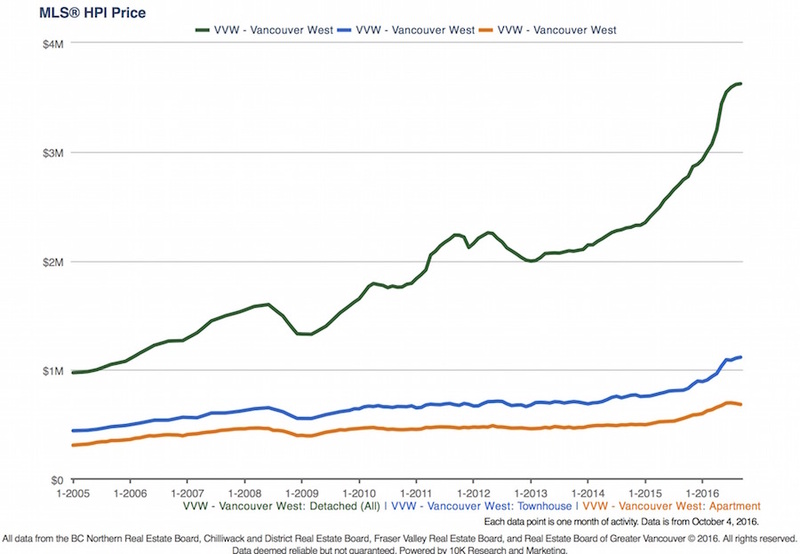 Bear in mind that over the last year prices rose 25-35% in Vancouver's Westside so it should really not be alarming if prices fall 10-15%. Presently average sale prices on detached homes have fallen less than 10% from their high point in July but I suspect that by the time December/January rolls around that they will have declined by about 15%. I do believe that pricing will stabilize and possibly even rebound in the Spring market of 2017 (I've certainly been on ther other side of this argument in the past). The underlying driving factors of incoming foreign capital (regardless of the new 15% tax) and low interest rates will very likely continue. 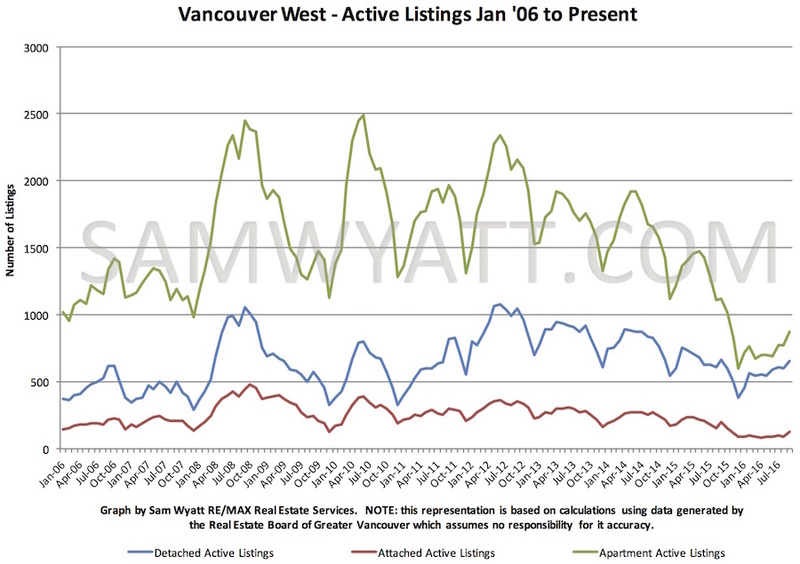 Active listing volumes generally peak prior to October. Active listings are on the low side compared to the past 5 years so I don't expect their volume to have too much influence on the market in the coming months. A couple of recent announcements from the federal government are worth mentioning this month. The first is a rule change about the reporting the sale of principle residences. Historically when one sold their home which they used exclusively for a principle residence (can claim one residence as principle for any given year) they did not need to report the sale to the Canada Revenue Agency (CRA). The new rule announced this past week requires that the sale be reported. There will still be a capital gains tax exemption on the sale of a principle residence but it must be reported. This is a smart move by the CRA to better enforce the existing rules for perennial flippers who may be considered to be engaged in the "business" of selling real estate rather than their "family home". The other announcement was a tightening of the rules for insured mortgages. The new rule is an expansion of an existing rule for insured mortgage terms under 5 years and for those taking out a variable rate. It requires that the borrower qualify for the loan based on the Bank of Canada 5-year posted rate rather than the usual discounted rates most folks get. The new rule expands to include all insured mortgages rather than just variable rates and those with terms under 5 years. According to the Department of Finance Canada Website: "The announced measure will apply to new mortgage insurance applications received on October 17, 2016 or later. This measure will not apply to mortgage loans where, before October 3, 2016: a mortgage insurance application was received; the lender made a legally binding commitment to make the loan; or the borrower entered into a legally binding agreement of purchase and sale for the property against which the loan is secured. Mortgage loans for which mortgage insurance applications are received after October 2, 2016 and before October 17, 2016 are also not affected by the rule change, provided that the mortgage is funded by March 1, 2017. Homeowners with an existing insured mortgage or those renewing existing insured mortgages are not affected by this measure." This change is likely aimed at mitigating the risk associated with the huge (about $500 billion) insurance liability held by the Government of Canada via the Canadian Mortgage and Housing Corporation. It will definitely knock some buyers down a peg in what they can buy in Vancouver's apartment market. Because you can't get an insured loan on properties over $1m and the rule existed already for many insured mortgages, it will have a narrow but real impact. NB: This Blog has been corrected. The existing insured mortgage rules were previously described as relating to mortgages under $500k rather than terms under 5 years.